When you think of eggs do you immediately think - strong! or weak? Let's conduct a few experiments to see just how strong (or weak!) eggs really are. Put an egg (raw) in the palm of your hand, place fingers firmly around and squeeze. What does it take to make it crack? A lot! 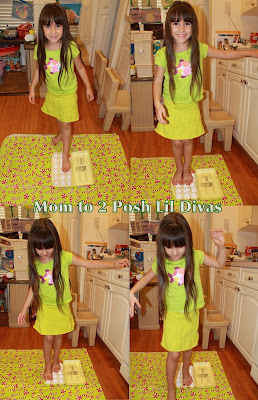 Both Lil Divas (& I) did this and the egg remained intact. The Lil Divas invited Daddy to try and he managed to crack it! 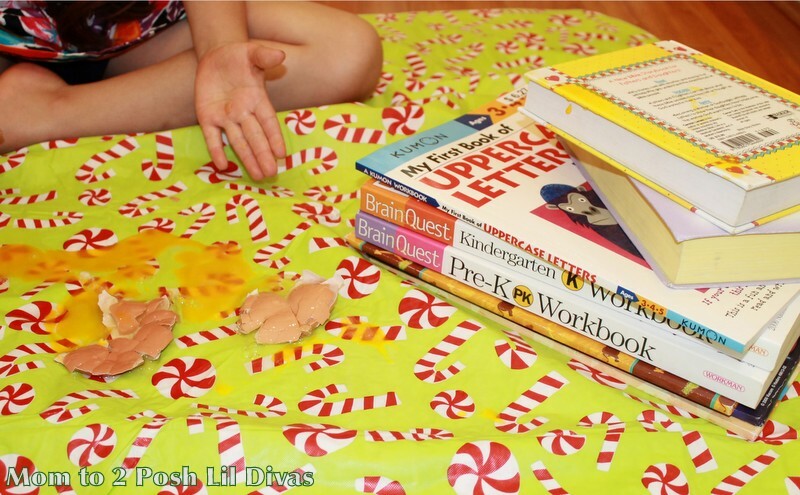 What a hilarious mess - egg sprayed out everywhere! Tip - make sure all eggs are pointed upwards for an even surface. The Lil Divas were very hesitant to try this one but once I managed to coax them onto the eggs they had a great time with it! The Lil Divas walked on and off the carton of eggs numerous times and the eggs remained intact. That's over 50 lbs of weight walking on those eggs! I'd call that strong. Then, they decided mommy should try it & SPLAT! Experiment #3 - Stack it on! it could withstand Lil Diva weight! 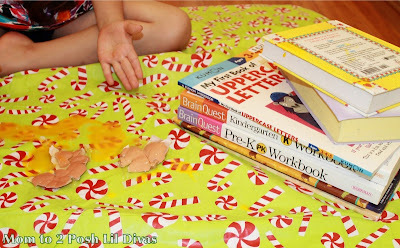 Next, we tested how strong an egg was on its side. Take 2 eggs and lay them on a covered surface a few inches apart. Begin to stack books on top of the eggs, 1 at a time. 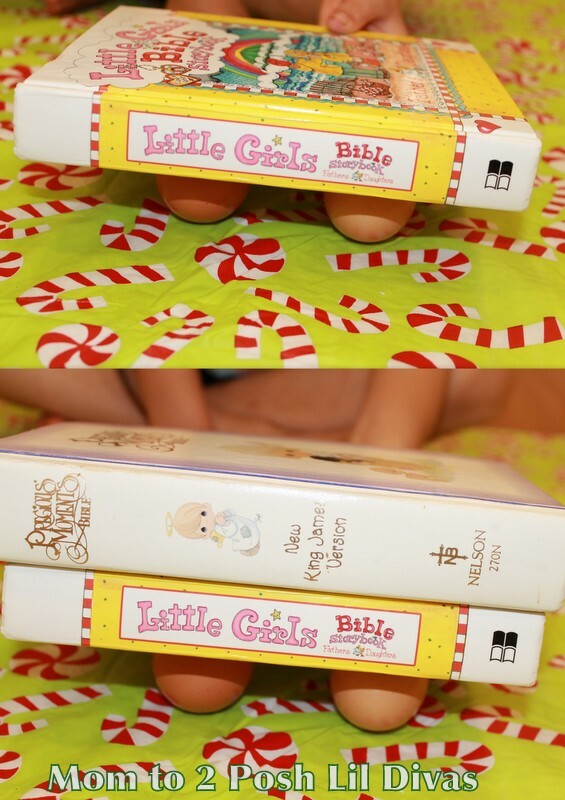 Stabilize the books by steadying them in place with the palm of your hand. 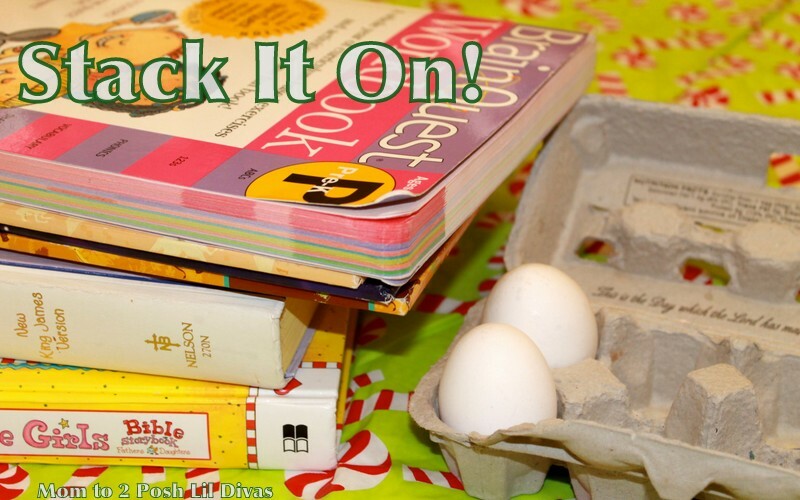 How many books can you stack before the eggs crack? Did you know eggs were so strong? 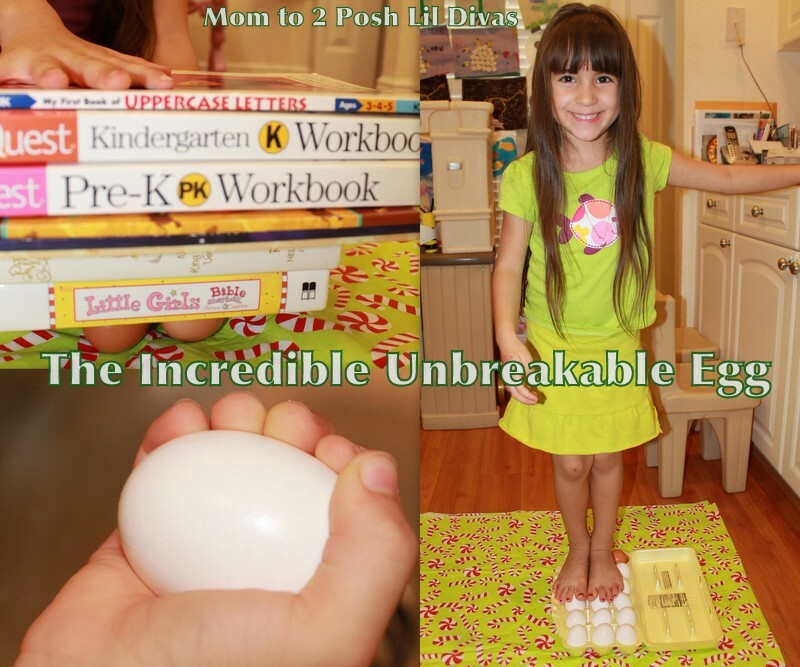 How would you explore with the strength of an egg? How fun!! It is funny to think about them as strong when we are so worried about breaking them. I remember in 3rd grade we had to build an egg house to drop an egg down a story and not have it crack. It was a fun challenge. 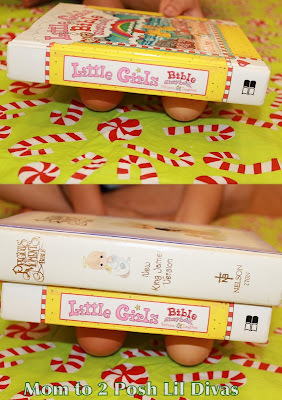 Oh, I don't know that I am brave enough to try it with my girls (maybe outside) but it sounds mighty fun! Thanks for sharing! Cute blog! I like this egg activity. I left you a Lovely Blog Award on my site for you to pick up. I love it! I've pinned it! Thanks. Loved the egg series! Great scientific exploration! As always I love these posts you do. Thanks for egg ideas. 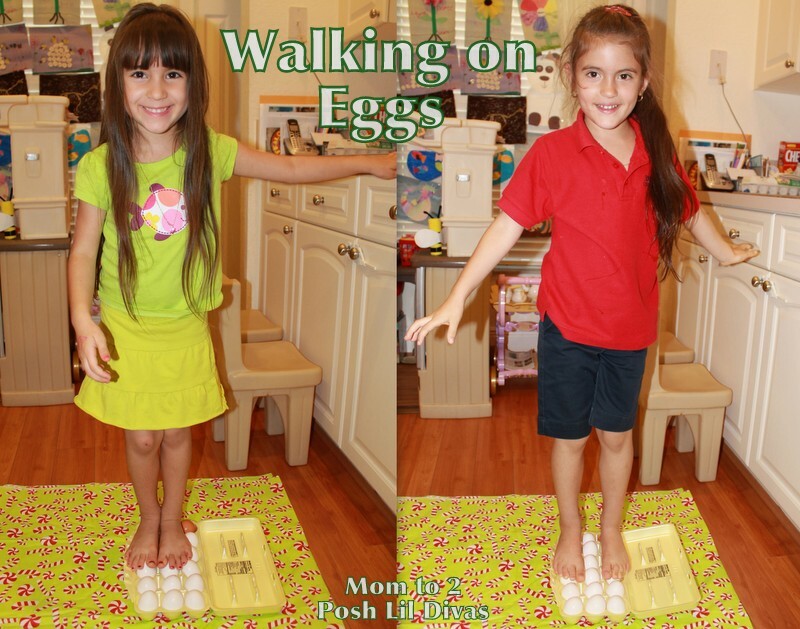 My girls would get quite the kick standing on some eggs! yes, the girls found that quite fascinating! Of course once I got on them & cracked them - well, that was even better! hehe! What great Science ideas! I definitely want to do all of these things when my girls are older. 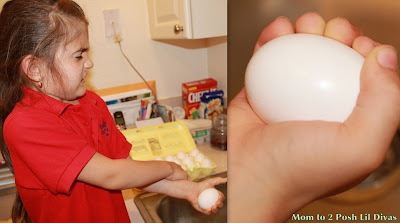 I had no idea it would be so hard to crack an egg in your hand. The whole idea of walking on eggs makes me nervous! But I think my little ones could manage. You may link to this post & use 1 photo if you like but please do not copy & paste my post word for word, even if translated to another language or use my photos. I hope you understand but we all work hard at what we do and taking the post in it's entirety would take away from my blog. It's wonderful you would like to share the idea and a link with 1 photo would do that. If not, feel free to re-create the activity and use your own photos and just crediting me as inspiration would be lovely, if you feel inclined.